There has already been a culmination about enthusiasm behind the most awaited question – ‘Who will become the next Prime Minister of India?’ and the results shocked (read – made happy!) many of us while some of us wanted different results (the Congress and AAP supporters who are not happy with such a drastic victory of BJP). The list of allegations on him is endless and some even make issue on why he refused to wear a Muslim cap on a particular rally. Whatever he does was making news, even his sneeze was telecast as a breaking news on national news-channels! What else could be better? It’s said that the amount of work ‘publicity‘ does in a day, ‘negative publicity’ can do that in a matter of minutes. Same was happening with the Prime Ministerial candidate of BJP – Mr Narendra Modi – who is accused to have brought the so called ‘Modi Wave’ in the nation which swept off the Lok Sabha Elections of 2014. His speeches included one or two controversial segments – usually his comments about the mother-son government (Congress) and their scams – which were telecast on TV again and again as breaking news and this helped him reach masses. Either people thought of him as a powerful man who could bring in economic development, or they thought of him as a terrorist, there were talks about him and that was something that brought in the so called ‘Modi Wave’, and India was soon modified! The political gurus had already prophesied about BJP to win in an unbeatable way this time, only because of one man in their army – Narendra Modi. He surely had something in his personality, or his ways, that mesmerized the people so much that they sent 336 lotuses to Parliament in Delhi this year. It’s not a miracle, but a planned and strategized method of sweeping off the votes to one side. Social media and television both played an important role in it. Narendra Modi, who was said to have developed Gujarat beyond measures, introduced 3D Hologram speeches in his rallies this election. He had an active team to update his social media accounts and in a way he interacted with youth in much better way than any other party could. His website was updated regularly with comments about him and his governance from the commoners and stalwarts. His website now contains a mosaic in which anybody can submit his/her photograph and it will be added to the mosaic. What a way of interaction? A new thing attracts us all, and we all want to try it. Narendra Modi brought in so many new things in these elections that he stayed in news for more than six months and that too in top headlines, unlike some other dramatic politicians who planned paid stunts but got the second class coverage. Narendra Modi’s ways to interact and act were new, innovative, unique and remarkable. No politician in the world has used the hologram way to deliver a speech before him, surely he was making news! One thing is sure about this man, that he’s better than any other candidate for the post of Prime Minister this year. His knowledge is remarkable, and his words are always measured. He attracted all kinds of publicity, positive, negative, doesn’t matter, but at the end, emerged as a sole winner and credit-holder of such a solid victory in history. BJP won over 272 (required) seats ‘alone’ and need no other party to form an alliance to make a government this time. I’m not a supporter of any political party in particular, but I do support Narendra Modi as a politician and as a person. I’m glad we have him as the prime minister now and I’m sure his tenure would be much better than what we’re being served with, since 10 years. At the end, it’s not about a political party you follow or support, it’s about the nation as a whole. On 16th May, the votes crossed the barricades of caste, creed and religion and people voted for BJP as ‘INDIANS’ and not as Hindus or Muslims. Communal things divide us, while secularism unites us. If you’re supporting Congress and another person is supporting BJP or any other party, don’t fight with him just because his choice is different from yours. Fight with him if he wants killings and riots in the country, and believe me, nobody wants that! The choice of a party is a personal opinion, while the truest form of freedom and safety is not a choice, it’s a right. 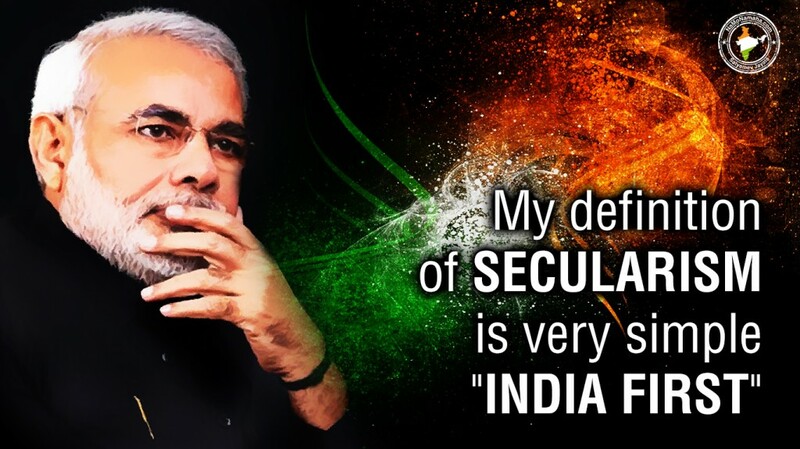 I hope the time with Narendra Modi as our prime minister will bring in harmony, peace and a lot of development as everyone is expecting. Read this book Manufacturing Consent: The Political Economy of the Mass Media for understanding media projected Namo Wave..